Toxic and safe for any surface. Biodegradable and safer for the environment. Charlie's Soap Kitchen & Bath Natural Cleaner is safe for all washable surfaces: countertops, stovetops, ovens, floors, tubs, showers, walls, tile, stonework, sinks, and toilets. Toxic and safe for anything washable. Biodegradable and safer for the environment. Charlie's soap cleans all the way to the fiber leaving nothing but the good old fashioned sweet smell of clean. 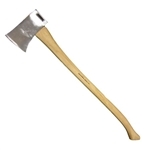 2# Hudson Bay Premium Velvicut axe is a shape and size ideal for camping, hunting, or hiking expeditions. The Hudson Bay is small enough to pack and carry yet big enough to get the job done. 2# head plus handle combines for an overall tool weight of approximately 2-3/4 lbs. Modeled after the well-known "Boy's Axe" of the US Forest Service, this beauty takes improved performance one step further. Like the Velvicut Hudson Bay, the axe is pierced with a special punch forming ribs horizontally and vertically inside the eye. Our unique upsetting technique creates more contact area and "bite" between the head and handle joint. The result? A stronger, more durable tool. 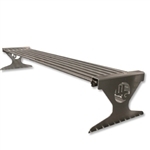 The Cape Fear warming rack is a great addition to your grill. It fits on any of the standard 30" grills. Great for breads or vegetables, it fits on the back of the grates and allows for the top to close.